This isn’t first time that BMW is coming with a safety car. Today here we are talking about the BMW M4 Coupe DTM Safety Car 2014, prior to which we have seen the M3, M5 and M6 Gran Coupe too marching their way towards the security edges. Well let us for now stick to our model of the day and have a look at the review of BMW M4 Coupe DTM Safety Car 2014 to know better about the changes and upgrades BMW inculcated in it, to make it worth a stand. While upgrading the BMW M4 Coupe DTM Safety Car 2014, company has portrayed the intense use of carbon fiber, especially throughout the exterior details of BMW M4 Coupe DTM Safety Car. To us while looking at this model the presence of high-end material came through the front splitter, mirror caps at the front end while at the back the spoiler and diffuser come drenched in carbon fiber. BMW has also took care of aerodynamic changes and added side skirts, which are further accompanied with coilover suspension. 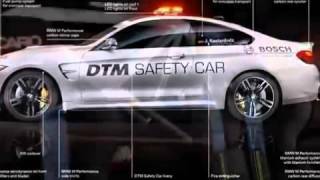 Rounding up the entire exterior of BMW M4 Coupe DTM Safety Car 2014 you have a must emergency lights, that come mounted over the roof. Moving close and marching to the interior of BMW M4 Coupe DTM Safety Car 2014 we find the stock seats missing and being replaced by the Recaro racing seats. Similarly the old seat belts also get replaced by the Schroth harnesses and thus together proving comfort and safety to those inside this safety car. Rounding up the interior the BMW M4 Coupe DTM Safety Car 2014 now gets just two seats as the rear sitting is now replaced with a new roll cage. The all new BMW M4 Coupe DTM Safety Car 2014 does not have any performance upgrades and thus comes mounted with a 3.0 Liter TwinPower Turbo six-cylinder engine generating total output of 431 hp and peak torque of 550 nm. The top speed of BMW M4 Coupe DTM Safety Car 2014 can touch the mark of 155 mph with the ability to knock 0-62 mph sprint in just 4.1 seconds.